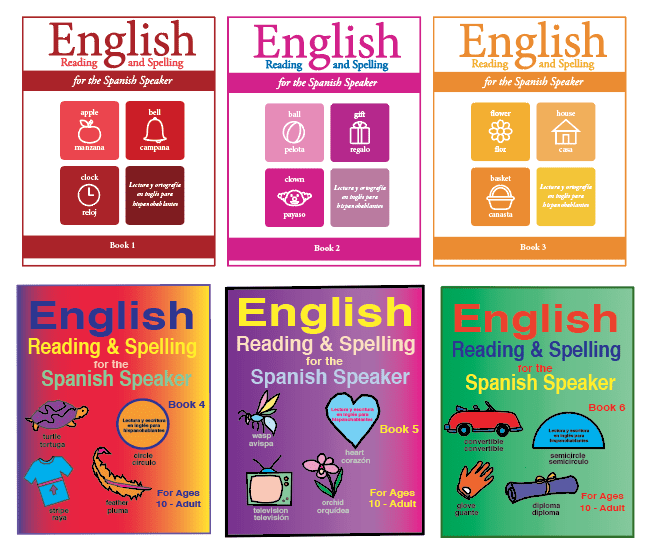 Fisher Hill’s English Reading and Spelling for the Spanish Speaker workbooks are now Ebooks that can be downloaded from our website. Click on Choose an option. You will have the choice of either bookor ebook. If you choose ebookthen you will be able to download the book after purchase. You can do this with each of the workbooks in this series. There are six workbooks. These six workbooks were written to help Spanish speakers learn to read and spell in English. Each workbook uses the Orton-Gillingam approach to teach the English speech sounds and each book provides practice with phonemic awareness, which is the ability to identify individual sounds and their order within words. Orton-Gillingham uses a multisensory, systematic, explicit approach to teach the 44 English speech sounds. Learning the different speech sounds will help students read and spell in English fluently. Eighty-five percent (85%) of words in English are phonetic. This book also presents many of the commonly used words, called sight words, that are not phonetic. The workbooks are bilingual because the word list for each lesson is presented in English and Spanish and the directions for each page is in Spanish. There are English translations at the back of the books for the Spanish directions. There are pictures to go with many of the words in the lists. Each lesson emphasizes one or two new speech sounds. The vowel sounds in English are different than those in Spanish, but many of the English consonant sounds are similar to those in Spanish. Most consonants in English have one sound. Vowels can make several speech sounds. Each lesson’s word list begins with words that contain the speech sound that is being emphasized in that lesson. The last two words in the list are sight words. Practicing English speech sounds, sight words, and their spellings will help Spanish speakers learn English reading and spelling. In English Reading and Spelling for the Spanish Speaker Books 4, 5, and 6, prefixes and suffixes are introduced and practiced. On our website, there are placement tests to determine which level a student should begin. A student needs a score of 80% to go to the next level. For example, if a student gets 60% on the placement test for level one, then that student needs to begin with English Reading and Spelling for the Spanish Speaker Book 1. These placement tests can be found under Teacher Resourceson our website www.Fisher-Hill.com. Teacher Resourcescan be found on the top tool bar. Click on Teacher Resources, then click on Reading and Spelling. Then scroll down to the placement tests. The placement tests are called Sound Spelling Placement Tests. Sound Spelling Placement Test Book 1is for Book 1. There are other free teacher resources for these workbooks on our website. There is a Scope and Sequenceto help you use the series. There are Word and Sentence Practicepages and Word Chainsto help with fluency. Visit us on line at www.Fisher-Hillto learn more about our English Reading and Spelling for Spanish Speakerworkbooks that can also be downloaded now.